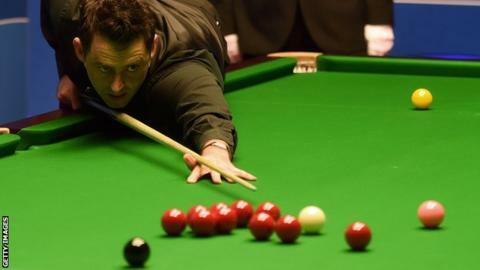 Ronnie O'Sullivan overcame an ankle injury and progressed into the third round of the English Open by coming from behind to beat Mark Davis 4-1. O'Sullivan wore blue trainers in his first round win and threatened to "pull out" after being told by organisers to wear the correct footwear. But he was given an exemption by World Snooker and wore black trainers, making high breaks of 136 and 134 to progress. Defending champion Liang Wenbo made a maximum 147 in his win over Tom Ford. China's Liang was a frame from elimination at 3-1 down but fought back to level things up with the maximum before a break of 60 in the decider edged him through 4-3. Fellow countryman Ding Junhui suffered a surprise 4-2 defeat by Welshman Michael White, but world number one Mark Selby comfortable beat Scotland's Ross Muir 4-1. Judd Trump thrashed Mark Joyce 4-0, Mark Williams overcame Luca Brecel 4-1 and Neil Robertson emerged victorious over Li Hang by a 4-3 margin. The English Open is the first of four Home Nations events, with a £1m bonus on offer if a player wins all four tournaments.